Something was jiggling above Miss Ruby’s hair. Something that shouldn’t be there. A round, brown body lowered itself on a silken thread. A brown body attached to eight spindly legs. A spider was dangling over Miss Ruby’s head! Sophie’s tummy turned scared-girl squirmy. A chill ran down her back. Brayden’s spider! She had to warn Miss Ruby. Sophie is a grade three girl who sometimes acts before she speaks, and sometimes speaks before she thinks. When she discovers her friend’s “pet” spider nesting in her teacher’s beehive hair-do, her first reactions land her in the principal’s office where misunderstandings go from bad to worse. In the end, however, all is explained away and the spider is safe and sound outside where it belongs. Holland’s word play around what Sophie says versus what she means will delight the age group for whom the book is intended, and the classroom setting, while somewhat old-fashioned, will be a familiar context for young readers. “Your ear!” yells Sophie to her mystified but spider-topped teacher. “You don’t want it on there. Get it off!” “Get my ear off?” the teacher responds. “You aren’t making sense, Sophie.” And here begins the fun. While some of the minor characters are a bit stereotyped—a male principal in a striped brown suit, someone who “no kid at school wants to see” and to whose office Sophie is sent because her teacher can’t get to the bottom of the confusion in class; and a female school secretary, wearing “pointy secretary shoes”—Sophie’s character is imaginative and appealing. 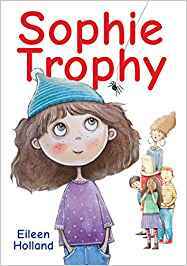 Sophie Trophy would make great independent-reading fare for classroom and school libraries as well as an addition to science units on spiders, particularly as there is a nice segment of internet research on arachnids as part of the storyline. Delightful illustrations by Brooke Kerrigan complete the package. Bev Brenna is the author of many books for young people including her “Wild Orchid” trilogy dealing with a teen protagonist who has Asperger’s Syndrome. She is also a professor at the University of Saskatchewan where her research interests include literacy and children’s literature.